I have had many projects planned and with my recent push to get the garage cleared out, I’ve finally gotten some long overdue furniture projects completed. And took the time to take the necessary photos as well. This piece I picked up a while back at a thrift store. I had gotten the two sections separated and that’s where it stayed for quite a few months. I actually was able to get a special boost from completing the outdoor bench from school desk chairs, as it provided me with the two additional legs that I needed for each cabinet. Once I attached the legs, I got a whole new energy to complete the project. Taking a queue from the existing appliques, I glued appliques to the drawer fronts – initially to hide the previous hardware holes – and found the perfect glass knobs. I then did a quick sanding of both cabinets and legs and launched into the priming and painting. I used a beautiful shade of off-white, more like a creamy vanilla color. With a couple of coats, the cabinets had a beautiful finish, but something was missing. I had this unique spray paint leftover from working on the carousel horse (soon to be showcased) that had a glimmer of pearl glitter and using that over-sprayed both cabinets. It was just the trick. I attached the knobs and the piece was set. I am thinking that this would be a perfect compliment to any little girl’s room, couldn’t you just imagine these flanking a big canopy bed? One more project down and only a few hundred to go! JK! I Took The Advice and This Time I Used Maps! After I finished the last dresser – covered with vintage dress patterns – someone made the suggestion to try maps. And I just happened to have some old road atlases from those days before GPS (do you remember that far back! LOL), so I plunged in. For the life of me I cannot recall where I picked up this desk, but it has been sitting in the third stall of the garage for a while. Its decent quality – inside one drawer is marked ‘Broyhill’ – so I figured it would be a good starting point. As you can see, I almost forgot about taking ‘before’ photos… I had it already up on the table with the drawers removed! Somehow these days, desks just aren’t in much demand. I guess with everyone having a laptop, sitting any where works and you’re no longer chained to a desk. So, with the help from The Kid, we removed the extra legs and shortened the desktop and turned it into a nice sized little chest. The bottom drawer is nice and deep, great for storing bulky stuff. I sold the sewing pattern covered dresser to this great couple for their daughter. She is into fashion, so it really appealed to her. When they came by to pick it up, they mentioned that they were looking for something for their son’s quite extensive Lego collection. Dad was a bit annoyed from stepping on those little plastic bricks in the dark as he was trying to check in on the kids as they slept – I’ve been there myself and it turns a very quiet excursion into some mighty loud yelps! So the very deep drawer might be just the thing for the family! The whole process of adding the maps was the easiest and funnest part. I just sit and watch television and cut and paste. I did some strategic placements, on one side is the state of Missouri and Kansas and on the top is a nice map of the states. Following two nights of drying/curing, I applied two coats of polyurethane to give the maps a little staying power. It could even take a little scrubbing if it gets colored on. I had the antique hoop knob pulls, rescued from a previous project that with a little green spray paint turned out quite unique! The drawer that was removed from the desk section turned out to be the perfect size for a replacement drawer in a sewing cabinet that I am transforming into a little entry way table. Don’t you just love it when things come together? If you’ve been reading my blog at all, you know that I hate to waste anything… and when it can be reused and saved from the landfill, I am a happy recycler! Tomorrow, The Kid and I are making the trek out to meet Rebecca “Becky” Collis of Collis Country Quilting! I am so excited to meet Becky and check out her setup. Most excited about finishing some of these quilts that I have been working on for the past three years! !I have another idea for a dresser makeover… would make the cutest storage piece for a little boy’s room. Have to keep my eyes open for the next perfect piece! So, it was no stretch of the imagination that I had to collect Monopoly tokens. I have quite a few now, I am guessing somewhere in the neighborhood of 40 or more sets, and some are super neat! I have learned much about the game’s evolution as well… did you know during World War II they didn’t use metal tokens (they needed the metal for the war effort) and wooden tokens were used in the game. I will have to take some time to photograph all my sets. Most of them live on narrow little shelves in my home office, but recently I have started collecting again, so quite a few reside around the little free space I have around my keyboard. But along with collecting the tokens, I ended up with lots of other Monopoly pieces. Game boards, property cards, Chance and Community Chest cards and dice. But mostly? Monopoly money. And I just knew there had to be something fun that I could do with all of it. I started kind of small, using some of the money to cover a star, boxes and tins. This was easy enough and once dry, I sprayed several coats of an clear sealant over the top. But, I knew that I had to do something bigger. And once I found an older but sturdy four drawer chest, I knew what was going to happen next! I started covering the sides with the Monopoly money and realized that covering both sides, the front and the top might be a bit too much. I finished the front and sides and kind of liked the plain white top (primer) but wanted to see what paint I still had in my arsenal. When I kind of squinted my eyes, I could see a lot of yellow/gold and the white, so I wanted to play one of the other three colors: pink, blue or green. When I checked my paint stock, I found a perfect blue (and there was plenty of it!). There was, of course, the drawers that had to be covered as well. This was all well and good, as I was able to watch movies and do the gluing. BTW, I simply used slightly watered Elmer’s glue, applied with a 1″ brush. Simply brush on the glue, lay on the bills and brush more glue over the top. It takes a little effort to make it look random and still cover all the surfaces. I tried not to get anything repetitive or lined up and tried to get as many upside down and sideways as right side up. I left the bills overhang the edges and sides and once dry, simply used a single edged razor blade to make a nice neat edge. I couldn’t believe how easy this was! Then I moved the cabinet into the garage and painted the top blue. It took several coats to get it saturated and looking really good. I also painted the inside edges of the drawer opens blue as well. Once it was good and dry, I rolled polyurethane over the entire box and drawer fronts (twice!) for a really glossy finish. It will make everything last a long time too! Now it was time to put drawer pulls on. It was The Kid who had the idea of making larger versions of Monopoly’s classic houses and hotels. And the houses were cut from 2″x2″ and the hotels from a 2″x4″ that we had in the garage. It was a fairly simple construction using the band saw. I then sanded them smoothly and painted them their iconic colors (standard Rustoleum high gloss paint from The Home Depot). We realized that they would need to stick out from the cabinet in order to be grasped, so The Kid cut 1″ dowels into 1/2″ segments and drilled through the centers (and of course painted). They were then glued into the centers of each ‘house’ and ‘hotel’ and by the time I got home from work, they were ready to be attached. This is one of those jobs that I keep The Kid around for! He is so good about measuring and taking care of the fine details! All that was left was to move it into the sunshine and take photos! And there it is! I think it would be great for a kid’s room, especially one who loves to play games (real games, not on their computers and phones) or to help organize a family room or rec room. It was just so much fun to make! This particular piece was made using Monopoly Deluxe Edition money, but I have several different editions (including Junior Monopoly) that I still want to use for something! So much fun! Have you done something like this? I’d love to see what you’ve done! I have a bad habit (sometimes) of starting projects that take me a while to get around to finishing. Actually in this case, I actually did finish it, but have been wafting back and forth about a final finishing piece. That, and I never got around to taking the final pictures either. And because of its sheer combined size, it isn’t like I can just drag it out and set it up and shoot the photos… and I always used the excuse about that final flourish to put it off. Well, time is up for procrastinating. This coming weekend, my neighborhood is having one of its two annual garage sale weekends. I’ve combed the house and really collected from every nook and cranny anything that I could live without. I have to admit that lately the house has been creaking from the excess that I’ve collected these past years. We’re going to have a really big sale! So, since we’re already using the driveway as a sales floor, I might as well as to it some of the furniture projects that I’ve recently completed. Including the dining room table and its eight chairs, as well as the the matching sideboard. So, me and The Kid dragged it all out and arranged it artfully on the lawn (partially on the neighbor’s lawn too) and took photos. I’ll just start with photos… now that I have them! The table was made by combining a salvaged door that I picked up from a Catholic church that was closing its school. The door was from the main office and I could only imagine had been pushed open by the hands of hundreds of little kids in cute school uniforms. The chairs were all from the same Catholic school… all of these were well worn, used and loved by students from that school. It took hours of sanding to remove doodlings and scratches but unbelievably, there was not a single wad of gum stuck under the seats! As you can see, six of the chairs became red, but wanted to create accent piece (or in this case, pieces). What better color to contrast with red than turquoise? Even better, I created a piece to accompany it. A mid-century piece, this is all wood. The drawers have dove-tailed construction and great detailing typical of the fifties. I love the spiral details on either side and I was able to fit it with a great set of vintage hardware that I painted black. The Kid and I have refurb’d many dressers and desk drawers, so bringing this piece was no challenge. The drawers glide beautifully and silently on their tracks and fit within their frames nicely. This is one of those times when I wish my house was empty (and I didn’t love my replacement round dining room table)! This sideboard rivals even my newly built piece, although mine has a little bit nicer top. So, finally, I can mark this one off the list. Now just to get it sold and be able to reclaim the space in my garage would be the icing on that cake! I have been running around like a crazy person, completing all of my necessary pre-op work and tests while trying to complete my own personal project list. When I realized that I would need to do certain things in my house to make it easier for me to get around once I have both my knee surgeries, I made a list. I think originally, there was about 12 or 14 things and I may have added one or two while working, but I am down to really only one big thing that needs to be done. For me, that is nothing short of amazing! Of course, I have had to pour on tons of self restraint not to pick up more projects or supplies, but I have been able to do it! Wow! I am very pleased with myself (if I have to say so myself!!)! Ha! So, tonight, I check off three more projects. Its sort of more projects but in the end it is three end pieces, so I will call it three. First, I picked up a dresser-styled chest of drawers a while back that I knew I wanted to keep. Somewhere in the past couple of years, a chest of drawers that I brought with me from California that was part of my quest suite got sold. It was a weird set of events that had me selling a project dresser twice – so the piece I already owned was substituted. Ever since that, I had been on the lookout for a replacement. I knew it had to be very high quality and had to have tons of personality. I had a cheap piece, more of a dresser, in the bedroom for a while, just to have a place to store crap. Can you believe this? Someone gave this piece away! I was so lucky to have been watching CraigsList almost at the time he listed it. He said my email came less than six minutes after he posted the ad and he had gotten over two dozen responses! There was only one small repair necessary and the top was in sad shape. You can’t really tell from the photos, but it was beyond saving. But since my guest bedroom is white with blue accents, it was destined to become white anyway. So, this dresser was picked up along the way and painted white just as a place holder. So, over the last couple of days, I emptied the drawers and slowly brought it down. Trust me, when you are working with two bad knees and a stair case, everything becomes slower! The new piece was painted carefully with the most purest white in a high gloss finish. To get it even and covered, it took five coats! I didn’t want to rush it though and wanted to do whatever it took to get it right. This piece was for me and I want it to last a long time. I went back and forth with how to paint the top of the chest. To keep the drawers working the best (behind the doors) I finally decided to keep the wood stain. But in figuring out how to paint it so that it was all white with the doors closed, it took a bit of figuring. But at long last, it was done and moved into its home back in the guest room. With that done, I need to get rid of the first dresser. Because the pink scheme sells well and I have all the necessary paint and tools, it was an easy decision. Next up is a cute little end table that I had hoped to become the base of a small cabinet. It didn’t quite work out, so I opted just to paint it and I’ll get rid of it on CraigsList. Next, is the little cabinet next to this table in the photo above. With The Kid’s help, we were able to convert it into just a cabinet, sans desk and legs. It was finished in my favorite shade of glossy red and fitted with new legs and matching cup holder pulls. Well, this has been a long day and an even longer week. Still so much to write about too! And I am nervous about next week and the dual surgeries and important that I get lots of rest. So I am going to put my feet up and watch some mindless television while I go get some more ideas from Pinterest! Pink Ombré: Can You Stand More? I don’t care how many times I do the pink ombré paint scheme, I still love it. And so do you, judging on how quickly the pieces sell and the comments and reviews they get! So, in case you’re new to the blog, or haven’t been here in a while, I am in the mode of completing projects without starting any new ones. In about three weeks, I will have the first of two knee surgeries a week apart and one thing that will be important is that I have unencumbered access around my house – be in a walker or crutches. Either way, as I completed six to eight weeks of physical therapy, I need to make sure that I can safely navigate my house. And all these projects stacked up in my dining room, my kitchen, my living room and specifically the garage do not allow safe access. So, I am working diligently to complete them all. However, with the completion of the pew, I no longer have the space for such a piece of furniture. Although it would sell quite easily, I may try to do this later next year. Yesterday those adorable flower petal handles finally arrived via eBay. The Kid took the time to put them on last night so that I could take photos and write about them today. I had primed these cabinets in white, which I think were okay with the pale pink color that it was painted, but I really do need to invest in more primer for red and the darker shades of pink. I am a firm believer in using the right tools and supplies for a superior end product. Another project that I was able to complete since I had the painting supplies out, is this little holder. I do a lot of faux stained glass painting and find that having the bottles upside down to keep the material at the tip is handy. So, I whipped out some more paint stir sticks and just sort of roughly laid them out to where I thought I needed them around the bottles. Then I drilled the holes large enough to allow the cap to sit securely without being wobbly or too tight. Then it just got a coat of red paint. I keep threatening, but soon I am going to write a post just about projects that I made using paint stir sticks. Dang, those are handy! So, here is a view of what’s left in the garage. I had to order a new pneumatic stapler to finish the bench (forefront) with denim cover and there is the other large chest of drawers. I am going to keep this one for my guest bedroom… it is needed to hold some of the specialty fabrics that I have no room for in my sewing room. Then, that leaves only the Scrabble table and one more bench (made from a headboard). This should should pretty much clear out the garage and I will be able to get my sports car bedded down for the remainder of winter. We finally had snow here in the Kansas City area and my little red guy is covered in the white stuff. Of course, that is the garage! Now, if all my pieces sell that would take care of the foyer too. 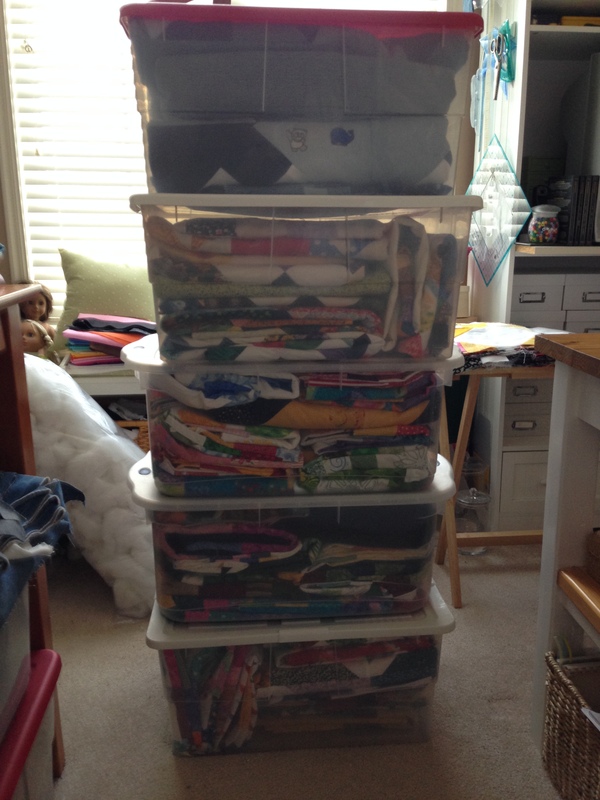 But I have projects going on in my sewing room too! But that should take care of getting safely around the house anyway! Today, The Kid made an offhand comment to me while I was working in the garage. Something to the effect of why I was going to so much work on the pew. Today, after finishing the sanding, expanding the slots for the bench, the gluing, the screws with the countersunk heads, the supports, the trim… I prepared to prime the bench. His comment was innocent enough, after all, this piece is for me. Why put so much work into it? Good question. Many people would look for shortcuts. There is a paint that is a primer and paint in one. Why worry about sanding off the old paint or varnish when you’re just going to paint over it? Why not just throw a few extra nails into it and slap some paint onto it? I was raised at the feet of a master. Nothing my Dad had ever built had been viewed by the masses or sold for money, but they were carefully and artfully crafted and loved by the recipient of the gift. He believed in what he did…if it was worth doing, then it was worth doing right. So, I spend the time and do all the steps. And hopefully, the work and treasures I build will be around a long time down the road. From starting with great pieces to using high quality products, I hope that they, too, become treasures to those who own them eventually. And why wouldn’t I put the time and effort into something being made for me? And the drawers to the nightstands are primed. I also made a couple of throw rugs from a hardy upholstery material that I found in my fabric stash (see the previous post for info). After I washed the fabric to remove sizing, I cut the piece in half. Then glued non-slip rug material on the back. Dried overnight and now they will adorn the laundry room and the kitchenette in the basement. You know me, I can never sit around and not do something! I have a couple of little projects that I’ve also been working on, more paint stir stick projects, that I want to write up in a single post. Thank heavens Home Depot lets me take as many as I need! We’re making progress! Oh, and I think I’ve sold my dining room table and chairs set! I am so excited! Tonight’s reveal was inspired by a friend’s little girl who loves to play dress up. Her mom indulges her with a more than abundant number of costumes, dresses and accessories. The mom’s main complaint? An easy way to store and organize all of them and still let the little one get to them easily. Anyway, it was a pretty quick transition – simply removed the top three drawers and their tracks. The dresser had a simple construction and side tracks, so once those were removed, it was just a matter of adding a ‘bottom’ just above the bottom drawer. The Kid is getting so good at understanding and following my absurd instructions lately, its kind of scary! Once he had that in, it was just a matter of priming and painting. This one was painted all in the lightest of the pink shades – blush pink – so, no taping or switching of rollers or brushes. Once that was done, a standard closet rod was added (so many leftover from previous closet remodels) and then picked out a pretty drawer pull. And it was done! This piece sold almost as quickly as I had it listed. I had an idea that at this time of the year, it might be a popular gift. I may try and do more of these before Christmas.